No great artist ever stands still. Yet no composer ever evolved to such an extreme extent as Arnold Schoenberg. Arguably the most influential composer of the twentieth century, and perhaps of all time, Schoenberg's fame arose from his escape from tonality and his innovation of the serial method. While detractors still demonize him for having destroyed music, the largely self-taught and hugely inventive Schoenberg saw his work as a logical evolution of cherished tradition. Schoenberg's first leap to the future was to atonality (a misnomer, but the label has stuck). Frustrated that tonality seemed exhausted and had reached its outer limits, Schoenberg felt that music had to transcend the constraints of the harmonic system of the past 150 years, in which melodies, harmonies and transitions all relate to the tonic tone of a given key. His solution was to equalize the seven diatonic and five chromatic notes, releasing them from the standard anchor points and predictable progressions so that they freely interrelate. 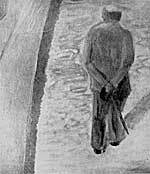 While most called it anarchy, Schoenberg found it liberating, an open-ended approach empowering composers to freely follow their personal creative impulses, while expanding upon, rather than rejecting, the approaches and techniques of the past. But to function effectively, freedom always requires fundamental rules. Schoenberg structured his approach through serialism, or dodecaphonic or 12-tone writing, a system in which all twelve tones are assembled into a "row" whose order (whether original, transposed, inverted or reversed) organizes the composition by using each note horizontally or vertically before any is repeated. Schoenberg viewed his technique as a melding of liberty with the German proclivity for order and control. There's one overriding problem, though, and it's a huge one, even after nearly a century of exposure – while some musicians and theorists are fascinated, and while analysis of the scores reveal intriguing abstract patterns, audiences hate the results. To all but the most advanced ears, the logic is elusive and the result sounds like a random, dissonant jumble, with wrong notes hard to distinguish from correct ones. Schoenberg, though, had no regrets – despite the richness and variety of his own 12-tone work and theoretical writing, he felt that he had only opened a door for future generations to explore possibilities, develop styles and establish conventions. Indeed, in his compelling critical writing, Schoenberg astutely observed that most masterworks were misunderstood in their time and urged frequent and expert presentations of truly modern work to cultivate a genuine appreciation for modern music, so that an accustomed public would come to regard it with genuine enthusiasm and not merely as a curious intrusion in otherwise pervasive concerts of repertoire of the past. Verklärte Nacht ("Transfigured Night") was inspired by a mystical poem by Richard Dehmel. In cold, moonlit woods, a woman confesses to her lover that she carries the child of another man she never loved but to whom she yielded for fulfillment. After a long pause of brooding meditation, he resolves that their love will make the child their own. They embrace and walk on, the formerly barren night transformed by hope and devotion. Such cloying sentimentality is rather hard to take seriously nowadays, and indeed Schoenberg later called the poem "repulsive" and urged appreciation of his work as pure music, portraying nature and expressing human emotion rather than depicting the specific action of the text. Its musical style melded the formal harmonies and variation structure of Brahms with the uninhibited sensual sonorities of Wagner, and thus reconciled the two poles of late 19th century musical aesthetics. Allen Shawn goes further by regarding Verklärte Nacht as a herald of the extreme organic unity of Schoenberg's later serial style. He marvels at its "abundance from economy" in which each theme seems a fluent variant on its predecessor. Thus, not only does the second half relate back to elements of the first, transformed by the lover's radiance, but all motifs are subtly connected, while the walking gait provides a constant rhythmic ground. This was music on the brink – not only through its historical position of looking both backwards and forward, but precariously poised on an emotional edge between despair and faith. Indeed, both bittersweet and gorgeous, it readily transcends its source and era with vast emotional resonance for our current yearning for stability despite an uncertain future as political and social fabrics seem so fragile and apt to be altered. On a personal note, for decades I have turned to this piece more than any other for understanding, empathy and hope in times of my own emotional trials. Despite the magnitude of his own aesthetic journey, Schoenberg never snubbed Verklärte Nacht (nor, for that matter, other composers who continued to write in a 19th century idiom). On his 70th birthday, when asked which of his compositions he then preferred, Schoenberg insisted that he still liked them all "because I liked them when I wrote them." Indeed, despite criticism of elevating sterile procedure over human feeling, all of Schoenberg's work shares an impulsive vitality that belies the critical canard that they are mechanical and unfeeling. Before veering into atonality, Schoenberg would go on to produce Pelleas und Melisande, a lush 45-minute score based on the same symbolist play as Debussy's contemporaneous opera, and Gurrelieder, a sprawling two-hour oratorio for mammoth instrumental and choral forces. Yet, Verklärte Nacht remains unique as Schoenberg's distillation of his early aesthetic into a concentrated and intense package. 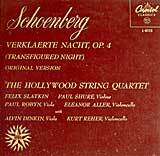 Schoenberg wrote Verklärte Nacht as a sextet for two violins, two violas and two celli, all of which he had mastered. The first recording of the original version arose at the very end of the acoustic era in a fleet, straight-forward and somewhat strident rendition by the Spencer Dyke Sextet as one of the first releases on the British National Gramophone Society label. An electrical recording of the sextet version had to wait until 1950 when the enterprising Hollywood Quartet played it for the composer at his home. By then sick, reclusive and notoriously difficult, at first he was highly critical but was speechless after they finished, agreed to write liner notes for their 10" Capitol LP, and sent them an inscribed photo thanking them for playing "with such subtle beauty." Although the playing is fresh and volatile, the rich sound is a bit blurred and dynamics are compressed, perhaps intentionally so as to aid reproduction at the time, reflecting the expertise shared by the Hollywood's members, who all led movie studio orchestras and knew how to sound good in front of a microphone. Of more recent vintage, the 1984 sextet version by members of Pierre Boulez's Ensemble InterContemporain (Sony), despite wiry early digital sound, allies sharp precision with riveting intensity for a powerful, deeply involving experience that evokes the style of its era through wide vibrato and expressive solo flights. Also crisp but deeply felt is a performance by the Smithsonian Chamber Players led by Kenneth Slovik, enhanced with a DVD of informative background and discussions (Dorian). 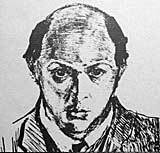 Schoenberg arranged Verklärte Nacht for string orchestra in 1917 and again in 1943, adding a part for double bass, varying the texture between ensemble and solos, and inserting tempo and accent markings. The first recording was in 1934 by the Minneapolis Orchestra conducted by Eugene Ormandy. Unlike their no-nonsense Mahler Second the following year, here they evoke a 19th century style – heartfelt and lush with lots of portamento (sliding into notes), their rich, smooth aura a herald of the "Philadelphia" sound Ormandy would later achieve with that orchestra. A second recording of the orchestral version emerged from the American midwest in 1945 with a gorgeously polished reading by Valdimir Golschmann and the St. Louis Symphony Orchestra. Yet, the overriding beauty slights the work's essential tension, an approach taken to the extreme by Yoel Levi and the Atlanta Symphony (1994, Telarc), who luxuriate the work over 35 minutes. The full depth and majesty of the orchestration is revealed in the 30-minute recording by Herbert von Karajan and the Berlin Philharmonic (DG). Yet, despite the frequent markings in the score urging "warmth," feeling seems wholly absent, leaving an overall impression of cold beauty, an aura perhaps appropriate to the objectivity of Dehmel's poem. It seems curious that conductors who defended tonality most vigorously against modern incursions shied away from Verklärte Nacht, perhaps viewing it as a stepping off into the void rather than as a final affirmation of traditional values. In any event, only modernists left us with recordings. Dmitri Mitropoulos led the New York Philharmonic in a hugely exciting supercharged account (1960, Columbia LP only), its propulsive, visceral drive fueled by sharp, fleet playing that leaves no time for even a shred of the poem's sticky sentimentality. As part of his pioneering 16-LP Schoenberg survey, Robert Craft led the CBC Symphony in a similarly fleet 25-minute account (1962, Columbia LP only) that Schoenberg advocate Glenn Gould disparaged as an analytic dissection more than a valid performance, and indeed despite its considerable propulsive force it seems detached and rather bland. Leopold Stokowski and "his" otherwise unnamed orchestra (1957, EMI) soars spiritually. Taking a somewhat typical 28 minutes, he revels in the color and richness of the massed sonorities, producing a sumptuous yet deeply passionate reading alive with an intensely human touch. An intriguing middle course between the intimacy of the original sextet scoring and the power and textural variety of the later orchestrations, the 15-member Orpheus ensemble (19xx, DG) plays with superb cohesion and emotional resonance. Especially compelling is their organic unity, a function of being leaderless, so that their expression arises from within. And for the most powerful reading of all – one that combines nearly unbearable tension, eternal profundity and seething intensity with an explosive emotional release – we return to Mitropoulos, this time in a spectacular 1958 concert with the Vienna Philharmonic (Music and Arts CD), leaving no doubt of Schoenberg's credentials as the culmination of Romanticism, even as he was about to turn the cultural corner to face the challenges and opportunities of the twentieth century. Of the many books I've read about Schoenberg, I wholeheartedly recommend Willi Reich's Schoenberg: A Critical Biography (Praeger 1971), which relies heavily upon extensive excerpts from the composer's own brilliant writing, as well as observations of colleagues and others, to detail his fascinating life, extraordinary achievement, wide-ranging influence and cogent outlook. I also especially enjoyed Allen Shawn's Arnold Schoenberg's Journey (Farrar Straus Giroux, 2002), who begins his "appreciative introduction" to his subject by noting, "I am neither a scholar nor a theorist," and presents an accessible and refreshing set of insights directed toward intuitive listeners. copyright © 1998-2005 Peter Gutmann. All rights reserved.